Revell 1/48 Ryan NYP "Spirit of St.Louis"
I think it’s safe to assume that every literate person in the world knows, at least in outline, the story of Charles A Lindbergh and his epochal flight of May 20/21, 1927 from New York to Paris.The successful completion of this flight won, for him and his backers in St. Louis, Missouri the $25,000 “Ortieg Prize”. This large, for the time, prize was offered in 1919 by Raymond Ortieg, a French gentleman who had worked his way up from dishwasher to hotel owner in New York. It was to be awarded to the first person to fly non-stop from New York to Paris. Many tried and failed; Lindbergh made it. 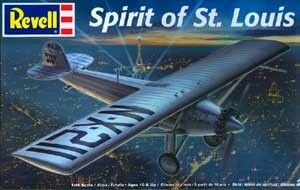 For those wanting a refresher, I refer you to Lindbergh’s own book The Spirit of St. Louis and to Brendan Gill’s Lindbergh Alone. It’s been 17 years since Glencoe reissued the old Lindberg (appropriate!) 1/48 kit of the Ryan NYP (I’ve no idea when the Lindberg kit was originally released but I’d guess 40-45 years ago) and even longer since Frog and Hawk issued their 1/72 kits. For their times the Lindberg and Frog kits were adequate; we modelers were much less demanding back then. These days Hawk kit is only good as wastebasket filler. AHM issued an NYP in their series of HO railroad compatible 1/86th scale airplane kits; it is quite buildable; better by far than the larger Hawk kit but it has become a rare/expensive “Collectors’ Kit”. Now – at last – Revell has come to our rescue with a good 1/48 kit of this icon of aviation progress. And it is, indeed, a good kit but it does have some problems, all of which are fairly easily to correct. The better a kit is, of course, the more critical we are of it. The kit is packed in an attractive, lidded box of adequate strength. I have to say, though, that the Paris cityscape over which the NYP flies on the box top looks, to me, more like 2005 than 1927. Inside this box we find eight pages of instruction material including a brief history in English, general instructions and colors guide in English and French, an eight step assembly process and a painting and markings guide. One page of these instructions is devoted to painting the pilot figure. The face of the figure in the illustrations is clearly that of Jimmy Stewart whilst the face on the figure in the kit is clearly that of C.A.L. himself. Decals are provided for the plane as it was on its historic flight and as it is now displayed in the National Air and Space Museum in Washington, D.C. Note, however, that if you wish to model the plane as it is now you’ll need to add the two flare tubes that were installed under the fuselage for the 1928 Latin American Goodwill Tour. You’ll also need to add some louvers to the sheet metal skinning behind the engine, install the wheels insides out and spray a transparent yellow over the sheet metal areas of the nose to represent the aging varnish applied many years ago to preserve the flags and other markings applied during the plane’s two, post-flight, “goodwill” tours. Revell provides what looks like a very good, simple solution to representing the engine-turned “swirlies” on the Spirit’s sheet metal; they have made decals of them! But they carried it a bit too far, providing the decal “swirlies” for the propeller spinner too. 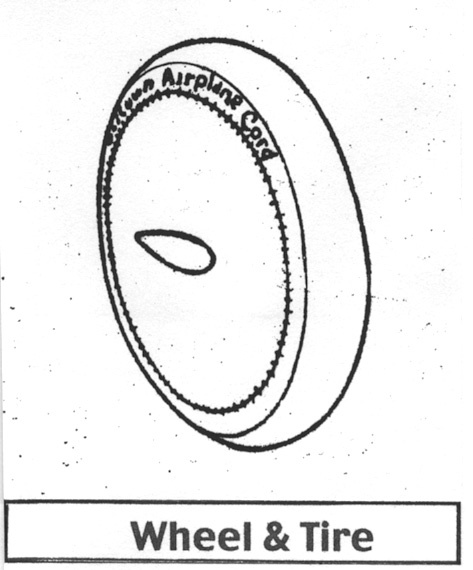 The original, round–end, spinner did have “swirlies” but that spinner cracked on the ferry flight via St. Louis and was replaced with a pointed spinner fabricated in New York. The new spinner is clean; without “swirlies”. The kit does not include the original rounded spinner as an option. If you want to model the airplane up to the time it arrived in New York, you can adapt the spinner from the Lindberg/Glencoe kit and use the “swirly” decals on it. 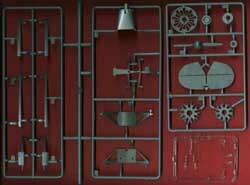 The kit itself comprises 49 flash-free parts cleanly injection molded in a medium silver-gray styrene and three windows molded in clear styrene. Engineering of the kit is conventional except for the trailing edge joint of the wing, which is set forward, about 1/8” (~ 4 mm), on the underside to provide a sharp, clean, trailing edge. That’s fine but it also means the fastidious modeler must now clean up a full span, 11 ½” (29.2 cm), seam inset from the T.E. against which the raised rib tapes abut. I reckon Revell did it this way to accommodate the casual builder by putting the messy joint under the wing, out of sight. My biggest complaint about this kit is the flat top and bottom surfaces of the fuselage. The NYP actually has three stringers running from the rear spar of the wing all the way back to the stabilizer on the fuselage top. It also has a keel stringer running all the way from the sheet metal skin on the nose to the removable service panel forward of the tailskid on the belly. 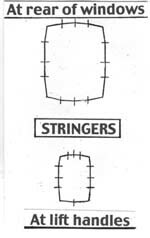 Two stringers that terminate in line with the generator for the compass parallel this central stringer. 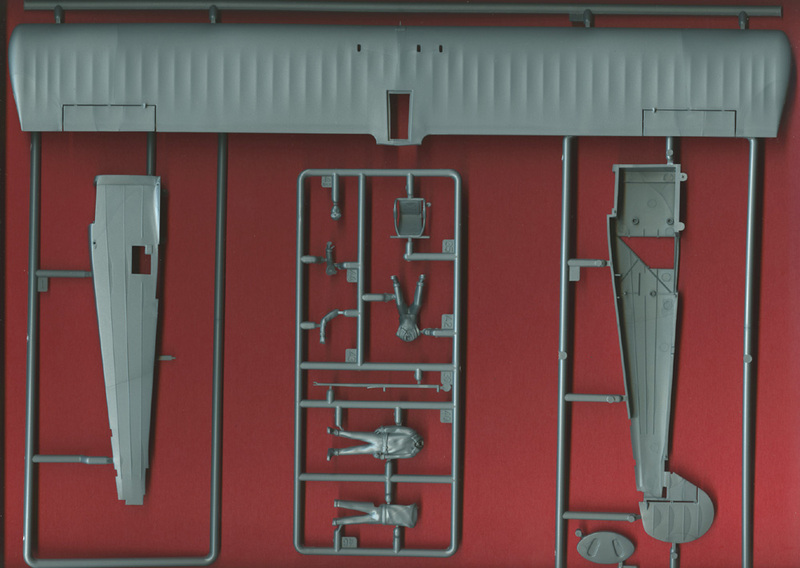 I suppose that in order to mold these surfaces correctly Revell would have to have made the fuselage in four, instead of two, pieces. 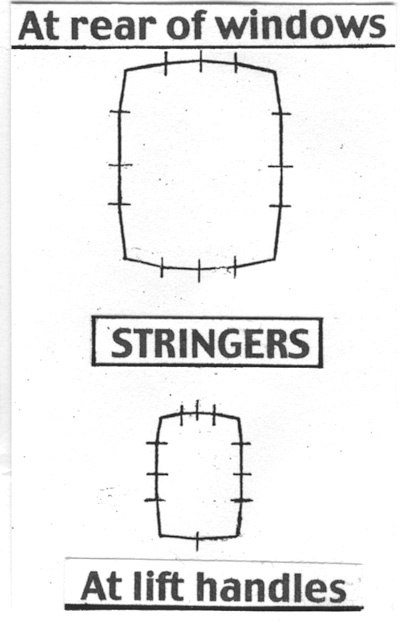 To correct this I’d recommend laying out overlays of .010” styrene sheet for the fuselage top and bottom with the stringers embossed from the inside Harry Woodman style. While you’re doing that you might as well correct the cross section of the top window; it is not flat. 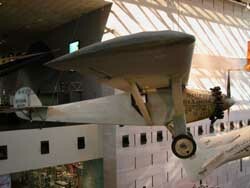 It is only flat at the rear spar of the wing but rises to a small peak at its aft end to match the fuselage stringers. Make a new top window of two pieces of thin clear material. My sketches, herewith, show these corrections. You also need to remove the raised stringer lines on the fuselage sides. The small bumper under the sternpost is too deep and needs filing down to match the real article. Revell provide two pilot figures, one standing and one seated but only one head is included. The H. E. McEwen drawing from the NASM aircraft book and the Aeromodeller drawing by R. G. Moulten are the best I’ve found but both have shortcomings. The 1/16th scale cutaway model of the Spirit by Andrew F. Leach shown on pages 66 and 67 of the book On Miniature Wings is a superb visual reference for anyone modeling the NYP. Prior to departure from San Diego the NYP was fitted with stronger wheels with fabric covers sewn into the sidewalls of the tires. These covers, and the sidewalls of the tires, were painted silver; only the tread surface of the tires and a small perimeter of the sidewalls remained black. The legend “Silvertown Airplane Cord” was applied in black on the outside faces of the tires on the silver painted surface between the stitching and the black tire tread. The decal sheet does not include these tire legends so you’ll have to make some custom decals or do a job of fine hand lettering. I think the wheels as modeled by Revel, are too neat. Photos show the fabric covers to be loose fitting and very wrinkled with uneven stitching. The Lindberg/Glencoe wheels capture this look quite well; lamentably, they have large ejector pin marks on their backsides. 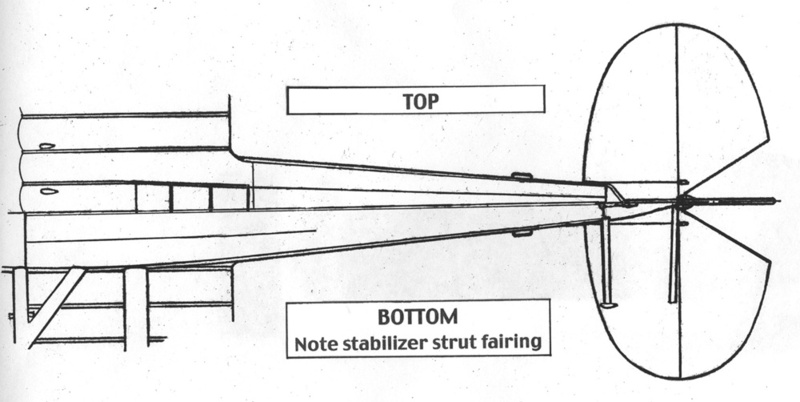 Another quibble is that the wing strut fairings on the underside of the wing are too small and somewhat misshapen; most modelers will, probably, ignore this and the absence of small, half tear-drop, fairings over the stab trim pivots on the outboard ends of the forward stabilizer struts. The cockpit interior is well detailed and very little else is required even if you leave the door open. 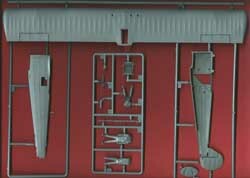 Revell has even included the map case on the right side of the cockpit, which they call an “accessory rack”, where Slim stowed the removable side windows when they were not in place. Buy one. It’s the best kit yet of Tubal Claude Ryan’s best known airplane. It’s not perfect but it is good enough to make us hold it to very high standards. Carefully built out-of-the-box, this kit will produce an excellent, if not quite accurate, model. An AMS’er can make a superb model of it with little effort. If you’re one of those modelers who just have to be different, you could build your kit as the NYP-2, J-BACC, which was an exact duplicate of Lindbergh’s plane except for the addition of windows on both sides below the original windows and different colors and markings. It was sold in summer 1927 to Japanese newspapers Tonichi and Damai to make a Japanese endurance and distance record flight in 1928. It had the rounded spinner by the way. Buy one. I paid $12.75, plus 8.8% state/city sales tax, for mine at Emil Minerich’s Skyway Model Shop in Seattle. 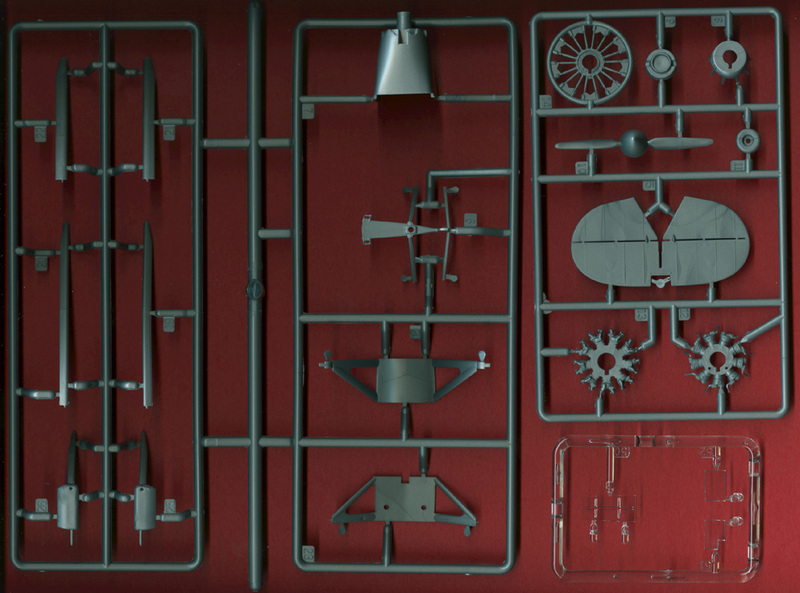 PS Do you think we can convince Revell to pantograph down their masters and issue a 1/72 kit of the NYP? Tamiya does it all the time. I’d buy a couple. · Aviation Quarterly, Vol. 3, No. 3, 3rd Quarter 1977, Lindbergh Trophy Edition: Airtrails, Inc. USA – no ISBN. 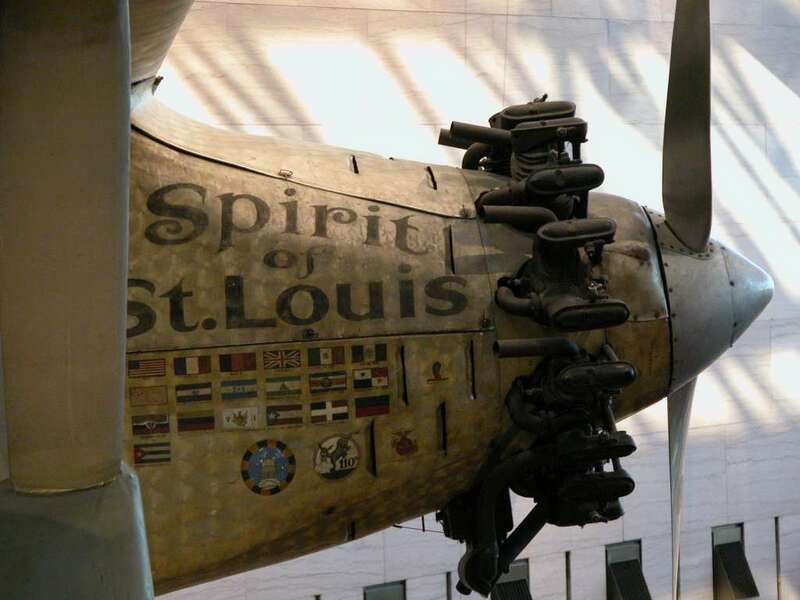 · Charles A. Lindbergh and the Spirit of St. Louis: Dominic A. Pisano & F. Robert Van Der Linden, Smithsonian Press, USA, 2002, ISBN 0-8109-0552-3. · Charles Lindbergh, An Airman, His Aircraft and His Great Flights: R.E.G. Davies & Mike Machat, Paladur Press, USA, 1997, ISBN 1-888962-04-6. · On Miniature Wings – Model Aircraft of the National Air and Space Museum: Thomas J. Dietz, Thomasson Grant, USA, 1995, ISBN1-56566-086-2. · Aircraft of the National Air and Space Museum: Claudia M. Oakes & Kathleen L. Brooks-Pazmany, Smithsonian Press, USA & UK, 1985, ISBN 0-87474-669-8. · Aeromodeller, June 1957, UK: Drawing and article by R. G. Moulton. · Skyways Quarterly, No. 42, April 1997, USA: Articles by Tom Doherty and Roy Meyers. · Aeroplane Monthly, August 1975, UK: Preservation Profile. · Aeroplane Monthly, February & March 1976, UK: Two Part article by John Grierson. · National Geographic, January 1928; Seeing America with Lindbergh; by Lt. Donald E. Keyhoe, 44 illustrations; Goodwill Tour of the 48 states. · National geographic, May 1928; To Bogota and back by Air; by Charles A. Lindbergh, 96 illustrations; Goodwill Tour of 13 Latin American nations. · Aeroplane Monthly, August 1987, UK: Article by Diana Prince. 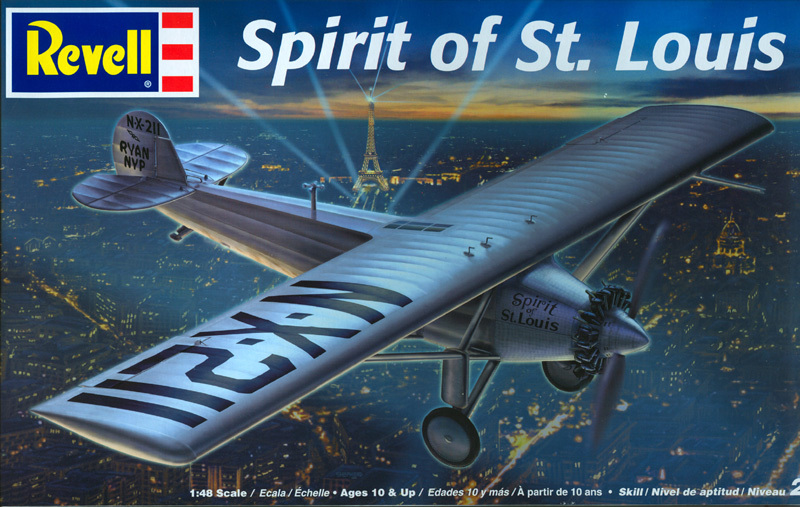 · The Spirit of St. Louis: Charles A. Lindbergh, Scribners, USA, 1953, no ISBN or Library of Congress numbers. This book was the carefully crafted, detailed account written after WWII to supplement C.A.L.’s original book “We” of 1927, which was quickly written while the event was fresh to capitalize on the moment. · Lindbergh Alone: Brendan Gill, Harcourt Brace, USA & UK, 1997, ISBN 0-15-152401-7.